The Revenant – Blood lost. Life Found. Directed by Alejandro Gonzalez Innaritu. Screenplay by Mark L. Smith, Alejandro Gonzalez Innaritu, . 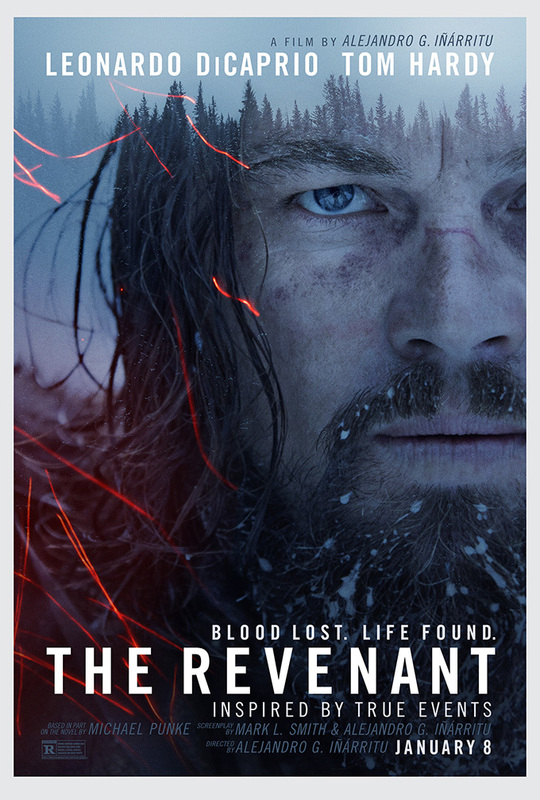 Hugh Glass (DiCaprio) is on an expedition of the American wilderness when he is attacked by a grizzly bear. His wounds are so significant that the group is unable to carry him through the forest. They decide to leave him behind until he is able to walk himself. Three others are paid to stay with Hugh including his half-native son “Hawk” (Goodluck). John Fitzgerald (Hardy) is upset because they left all the pelts behind and he only gets paid if they have pelts. He also decides to stay because they are offered extra money to help keep Hugh alive, if Hugh dies he is supposed to get a proper burial. The story turns to betrayal and murder. Hugh is left for dead and this movie is about his incredible journey back from the almost dead. Andrew Henry (Gleeson) is in charge of the expedition and he is an honourable man, but he is pushed to his limits when he hears of the betrayal. This movie is impressive on so many levels. the direction from Alejandro Gonzalez Innaritu is impeccable. The performance from Leonardo DiCaprio is without a doubt the finest of his great career and I believe it will get him his first Academy Award. His acting is driven by facial expressions, because his characters dialogue is so limited. This performance drives the entire movie and gives us one of the best movies of the year. Directors’ Previous Movies: Birdman, Babel, Biutiful. If you liked this try: Seraphim Falls, 3:10 to Yuma, The Hateful Eight.